Joe Savani born 19-- in Calumet, was the former coach and manager of many of Calumet's senior teams throughout the 30's, 40's and 50's. He was the coach of Michigan Tech Hockey team 1937-38, under his direction, they won the regular season Conference Title, won Conference Postseason Tournament Championship and went to the NCAA Tournament (top 4 finish). During 1937-38, Savini coached both the Michigan Tech Huskies and the Calumet Olympics senior team. The Calumet Olympics won both the Michigan A.A.U. state championship and the MacNaughton Cup that year. In his younger days he played both hockey and baseball in the Calumet area and was a baseball teammate of George Gipp from 1917 to 1920. Maximilian Seel, born 1980 in Germany, grew up here and played hockey for Houghton High School as a Freshman and Sophomore where he won All Conference and All State Honors and was the LSC leading scorer and played on Michigan's Select 16. He then played for Detroit's Little Caesar's Midget AAA as Junior in 1997-98; when they were Michigan AAA Midget Champions and placed second in the Nationals. He also played with Little Caesar's as a Senior in 1998-99. Max went on to play hockey 2 seasons 1999-2001 with the Green Bay Gamblers when they were runners-up for National Junior A Championship, then 3 years 2001-2004 for Union College in Division I ECAC. On his college hockey bio, it asks "Who has had the most influence on your game: His answer was "Joe Bukovich". Max has consistently earned academic awards on his teams. John Sherf, born in Calumet (1914-19--), played four years on Calumet High's undefeated teams, and went on to play three years with the University of Michigan where he set a league scoring record, and in his Senior year, he was Co-Captain of the team with another Calumet native, John Jewell, when their team won the Big 10 Championship in 1934-35. He was with the NHL Champion Detroit Red Wings, when they won the Stanley Cup in 1936 and again in 1937. That same year, he participated in an NHL skills competition and won the fastest skater award. He was one of the first American born players on a Stanley Cup winning hockey team (Taffy Abel of Sault Ste. Marie was the first American; with the NY Rangers in 1928.) 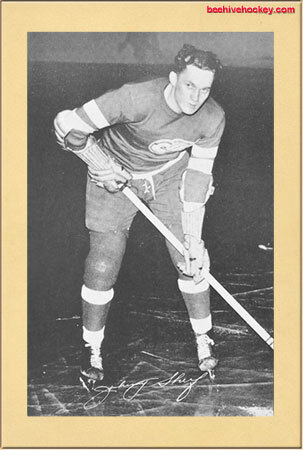 Sherf played 8 seasons of organized and pro hockey from 1935-44 with the Red Wings and the Detroit Olympics as they moved and became the Pittsburgh Hornets in the IHL. 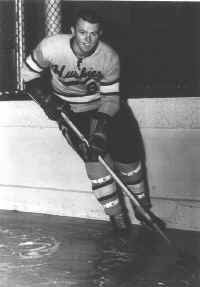 Sherf played in the first AHL All Star Game Feb 3, 1942. He missed the 1942-43 season while in the military, then came back and played during the 1943-44 season with the Red Wings. He was inducted in the U of Michigan Dekers Blue Line Club Hall of Fame in 1965 and was inducted into the UP Sports Hall of Fame in 1979. In 1981, he was honored as the second Michigan hockey player to be elected to the Univ of Michigan Athletic Hall of Honor, one of only 12 UofM hockey players to ever be so honored. 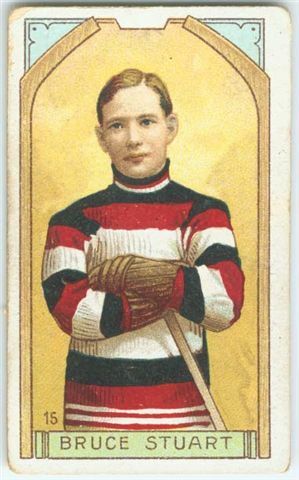 William Cooney Shields, born 1877 in Orangeville, Ontario, played right wing on the 1903-04 and 1904-05 Portage Lake Pro team and part of the 1904-05 season with Calumet. He "lost an eye playing hockey, but despite that handicap, for years served as a referee - and a good one" according to N.J. Gillespie, Winnipeg Tribune Magazine March 11, 1933. Burt Siligmann, born 19-- in -- of Hancock, played 1966-67 at UW-Superior. Todd Steinmetz, born 1974, a native of nearby South Range, played local junior hockey and two years at the high school level for Jeffers High School (freshman) and Hancock Central High (sophomore). Todd went on to play Midget AAA for the Marquette Electricians, where he received the Peter Bartanen Memorial Award for Outstanding Inspiration and Leadership, and then in the North American Hockey League for the Kalamazoo K-Wings. 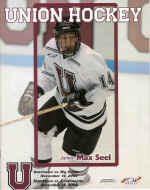 After finishing high school, he played in the United States Hockey League for the Waterloo Black Hawks in Waterloo, Iowa. Todd was offered an athletic scholarship and played four years of college hockey at Ferris State University. 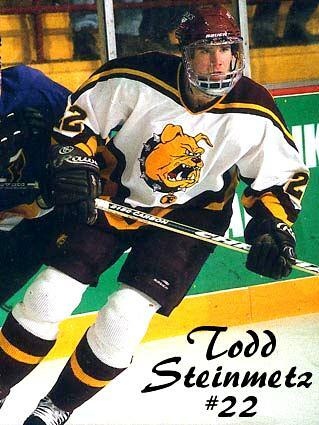 Following collegiate hockey, Todd went on to play professional hockey in the East Coast Hockey League, finishing his playing career with the Toledo Storm in Toledo, Ohio, where he was awarded the Most Improved Trophy. Todd resides in Trenton, Michigan and is an assistant hockey coach at the St. Mary Catholic Central High School in Monroe, Michigan where he serves as the Assistant Principal. Bill Steele, born 1952 in -- played hockey 4 seasons for Michigan Tech 1971 to 75. He then played three seasons in the SHL, NAHL, WHA and AHL from 1975-1978. .. need picture and info here! Bill and his family live locally here; he works for Michigan Tech for the Hockey Enrichment Campaign. Randy Stevens, born 1973 in Sault Ste Marie, Michigan, played hockey for Michigan Tech 1991-95. He then played in the ECHL, IHL, AHL CHL and Germany from 1995-2000. Randy makes his home here in Houghton.... need info and picture etc here. Mike Stimac, born 19-- in -- a Jeffers High School hockey player, plays for the local Finlandia University Hockey Team. Jay Storm, born 19-- in -- a Hancock native, played hockey for Michigan Tech during parts of the 1993-94 season. Jim David Storm, born 1971 in Milford, Michigan played hockey three seasons for Michigan Tech 1990-93, scoring 63 goals; He played parts of three seasons with the Hartford Whalers and Dallas Stars in the 90's and team USA 1993-94; he played pro/semi pro from 1993-98. Fred Strike, born in 19-- in Canada?, was a player on the Calumet IHL Pro team that won the First IHL Pro Championship for the 1904-05 season. Abbey Strong, born 19-- in -- a Houghton native, played on the local 19U Girls K-Wings team two seasons (1996-98). In 1998-99 and 1999-2000, she played with the Wisconsin Challengers, who went to the Nationals in 1998-99. After graduating from Houghton High School in 2000, she played at the University of Findlay, Ohio, for two seasons, winning the Great Lakes Women's league playoff in 2000-01. She transferred to the University of North Dakota and played two seasons 2002-2004. Abbey plays a high scoring defense; she led Findlay' guards in scoring as a freshman. 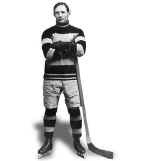 Bruce Stuart, born 18-- in Ottawa, Ontario, he played 3 seasons with the Portage Lake Pro Hockey team 1903-04, 1904-05, 1906-07 scoring 68 goals in 65 games; he was named First Team All-Star in 1906 and went on to be Captain of the Ottawa Senators when they won the Stanley Cup Championship 3 consecutive years in 1909, 1910,and 1911. He played 14 seasons of organized and then pro hockey from 1898-1912. Bruce and his older brother, Hod, were two of the original twelve inductees to Hockey’s Hall of Fame in 1945. William Hodgeson Stuart, (1879-1907) "Hod" was born in Ottawa, Ontario, played defense on the Portage Lake Pro team 1903-04, scoring 13 goals in 14 games even though "no one spent more time penalized" (23 minutes) than Hod. For the 1904-05 season, he played for the Calumet Miners of the International Hockey League and scored an impressive 18 goals in just 22 games. He was selected to the IHL First All Star Team in 1905 and in 1906. In the 1906-07 season, he skated with the Montreal Wanderers to win the Stanley Cup. He played 10 seasons of organized then pro hockey from 1895-1907. His hockey career was cut short by a fatal dive into shallow water June 1907. Hod and his younger brother, Bruce, were two of the original twelve inductees to Hockey’s Hall of Fame in 1945. "Jerry" Gerald B. Sullivan, born 1938 in Ottawa, Ontario. 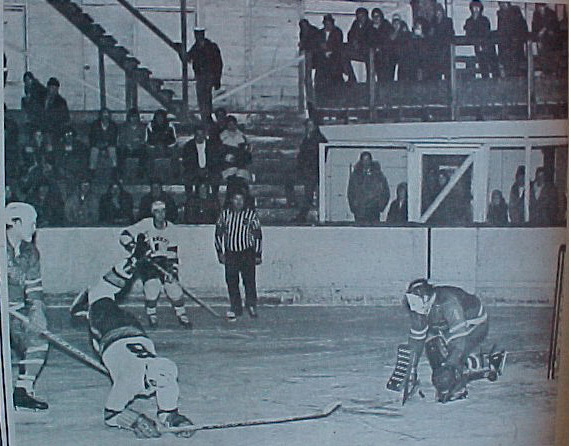 Sully played for the Hamilton Tiger Cubs in the OHA before coming to play with Michigan Tech four seasons 1959-62. At MTU, he was picked Team MVP 3 years in a row, and picked All-American in 1962. For a number of years he held the MTU records for most goals in a year, most points in a year, and most points in 3 years! After college he was MVP of the semipro Green Bay Bobcats 1962-63. He then coached in Helsinki, Finland (HIFK): Division 2 for 1963-64 season and Division 1 for 1964-65 season. He returned to the Green Bay Bobcats and was playing there when they had an exhibition game in the 1966-67 season with the Chicago Blackhawks to encourage pro hockey in Green Bay. He played semi pro hockey with the Marquette Iron Rangers from 1967-1973 where he was their leading scorer; in 1972-73 he was the player/coach for the Marquette Iron Rangers. Sullivan coached the Marquette Jr hockey PeeWee AA team and won the State Championship in 1973-74. He was the Head Coach of the Marquette High School Hockey Team for 19 years 1974-93, winning the State Championship 1976-77, 1987-88 and two runner-up finishes in 1979-80, 1983-84. 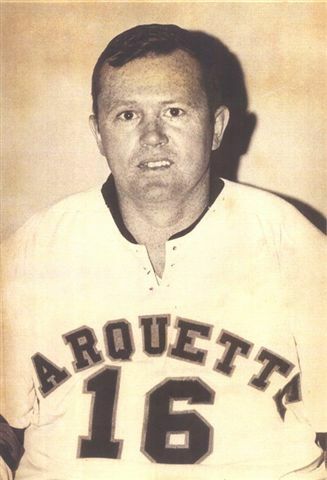 At the same time, he coached the Marquette Squirt AA in 1986-87 and the Marquette PeeWee AA in 1988-89. He has been a summer resident of the Copper Country for over 30 years as he has been the Manager/Asst Manager of the Michigan Tech Hockey Development Center since it opened in 1972. Gerry was inducted into the Michigan Tech Sports Hall of Fame in 1986 and the Upper Peninsula Sports Hall of Fame in 1998. He is also a and member of the Society of International Hockey Research. Gerry Scores for the Marquette team. Paul Wright Swift, born 1912 in Hancock, played hockey with Michigan Tech 1932-33. He has been an active supporter of Tech Hockey and Football ever since. He was a Charter Member of the MTU Huskies Club in 1958. Paul was inducted into the Michigan Tech Sports Hall of Fame in 2002.